Looking to do something special for Dad on Father's Day? Present him with this trophy to let him know how much he means to you! Print the trophy on regular paper or cardstock and cut out the pieces. 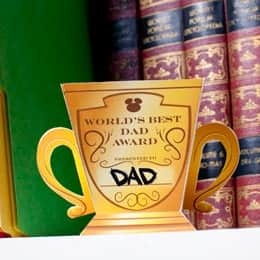 Have your child write their dad's name and include a special message on the opposite side of the trophy. Make all the indicated folds away from you, except the four folds that are clearly marked "fold toward you." Make sure you also fold the eight tabs away from you. Now, starting with the "A" tabs, glue them to the base and side of the trophy that they are nearest to. Do this with "B" tabs next, and so on until all of the sides are attached. Fold the handles in half away from you. Next, fold each of the tabs back so that they create a flat surface that you can glue to the side of the trophy. Do this for both handles.